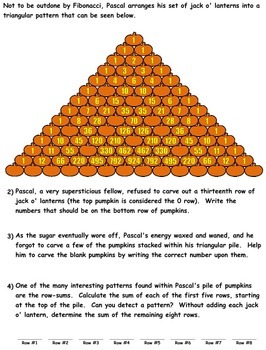 I took two well-known mathematical patterns, the Fibonacci Sequence and Pascal's Triangle, and spun a bit of a Halloween yarn. 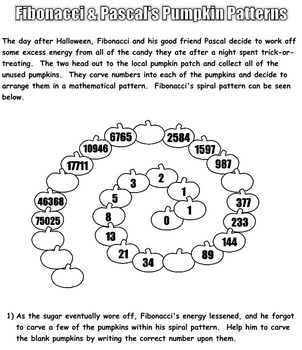 Fibonacci and Pascal, good friends, decide to burn off some excess energy from all of the candy they have eaten after trick-or-treating. They head out to a local pumpkin patch, collect all of the unused pumpkins, carve numbers into them, and arrange them in their respective patterns. As their bodies burn through the sugar from the candy, their energy waxes and wanes, causing them to forget to carve certain pumpkins within their pattern of jack-o-lanterns. 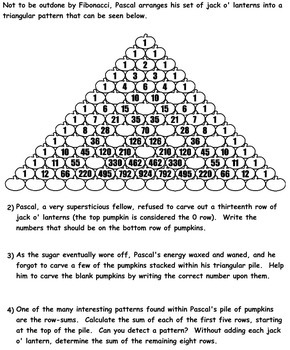 Students are then asked to find the pattern within each mathematical sequence, and then "carve" the numbers into each of the forgotten jack-o-lanterns. This file contains both a color and black-and-white version of each sequence. They are the exact same otherwise, it simply comes down to your own personal preference. An answer key (in B&W) is also included. 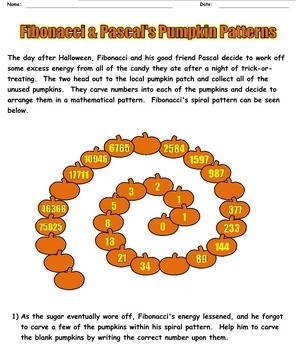 This activity can be used as a fun challenge for your students, or a mathematical center for October or November. I hope you and your students enjoy it!